Purchase requests are available for Premium subscribers only. If you are a Traveller or a Travel Assistant, you won’t be able to purchase tickets yourself. Instead you have to make a purchase request with your Supervisor. To this, simply add tickets to your cart and then click on the Purchase Request button. You can select whichever Supervisor should take care of the request. Remember, the purchase request needs to be approved before the date indicated, otherwise the pre-booked ticket will expire and the reservation can no longer be made. Certain tickets with low and non-refundable fares will have a very short expiry period of around 30 minutes. If this is the case for your tickets, we recommend quickly contacting your Supervisor outside of Trainline to have them approve the request. Once the purchase request has been made, an email is sent to the Supervisor and your ticket will be pending validation. You’ll also be able to see this in your account. If the purchase request has been approved, you will receive further instructions on how to print your ticket. These instructions are also available in the Tickets section of your account. 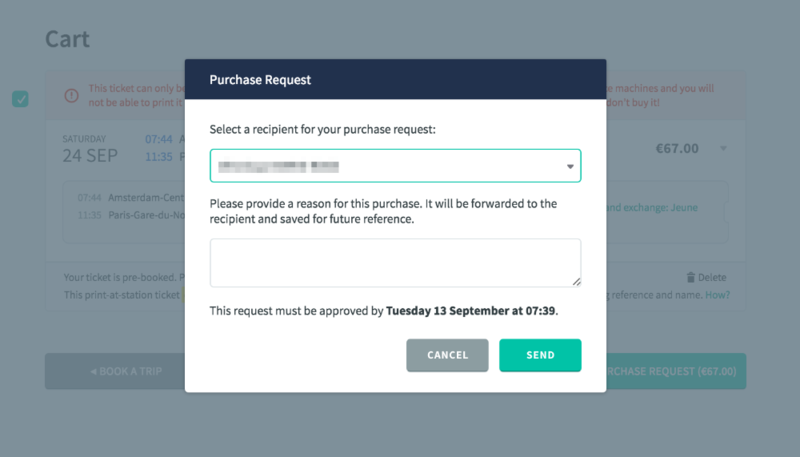 If the request has been refused, the ticket will return to your cart until it is due to expire. You can of course make another purchase request if you wish.